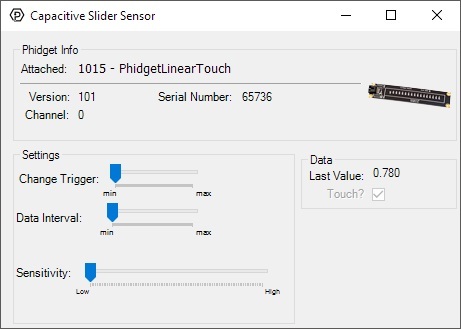 The PhidgetLinearTouch detects changes in the capacitance between the on-board electrodes and the object making contact. The side of the circuit board opposite the connector and components is the side intended for contact. The 1015 can be mounted behind a sheet of glass or plastic; The recommended thickness is 1/8 inch. Use Silicon adhesive when attaching the Phidget to the material; standing the PhidgetLinearTouch off or creating space between the separation material and the Phidget can cause false-triggering to occur. Materials thicker than 1/8” may work, but will require a larger surface area of contact to ensure proper triggering (i.e. : two fingers instead of one). Sliding a finger along the touch sensor varies the Analog Input 0 value from 0 to 1000 in approximately 125 discrete steps. When the finger is removed, the final measured value is retained. Two Digital Inputs are used to convey additional information: Digital Input 0 is True when contact is made with the Phidget, and Digital Input 1 is True when a finger or object comes in close proximity to the board. The Analog Input value is valid when both Digital Inputs are true. 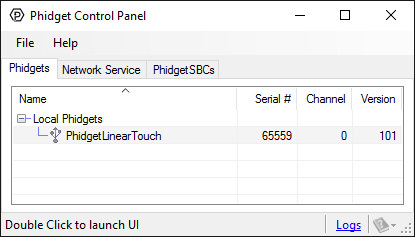 The PhidgetLinearTouch connects directly to your computer via USB, and uses the CapacitiveTouch object in software.